If you are a pirate enthusiast, like myself, Talk Like a Pirate Day (TLAPD) can be agony at the office. You may fear judgement from colleagues regarding your eye patch, or perhaps are concerned about offending your subordinates when referring to them as “bilge rats.” Don’t despair me hearties! I’ve got a series of tips on how to celebrate Talk Like a Pirate Day tomorrow while maintaining professionalism in the office environment. International Talk Like a Pirate Day, celebrated each year on September 19, originated in Albany, Oregon in 1995. Friends John Baur and Mark Summers created the holiday after one of them shouted “Aaarr!” in response to a injury during a racquetball game. In 2002, the pair sent a letter to humor columnist Dave Barry, who promoted the holiday and helped it gain international exposure. Baur and Summers have kept the spirit of the original holiday in tact, refusing to trademark the holiday and keeping it open to different ideas and adaptations. The key to successfully celebrating Talk Like a Pirate Day in the corporate environment is to know who among your professional colleagues are fellow pirate lovers. Before tomorrow’s celebration, print out a few of these posters and post in key areas of the office. The subtly of the posters will avoid stirring suspicion among land lubbers, while alerting fellow pirate fans of the upcoming holiday. Look for employees who linger at the poster or pass by with a knowing smile on their face, and you’ve got the start of your pirate crew! To encourage camaraderie throughout the day, be sure to give each member of your crew nicknames. If you’re lacking in ideas, try the Pirate Name Generator. 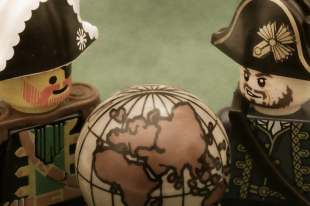 For those brave souls looking to push the envelope, you can try working in some of the more advanced pirate phrases covered on the International Talk Like a Pirate Day website, such as hornpipe and grog. Besides communication, the toughest part of celebrating TLAPD at work is deciding what to wear. A peg leg and Jack Sparrow wig may be a bit much for your office, but that doesn’t mean you can’t show off your pirate enthusiasm in other ways. Start with bold accessories, such as lots gold rings or a single hoop earring. These items won’t seem out of place in a professional environment, and you can always feign surprise when someone points out your single earring. Additionally, striped attire in red, white and black hues can keep you in the pirate mood, while not alerting fellow employees to your true motivation for the fashion choice. Your Talk Like a Pirate Day celebration doesn’t have to wait until you get home. With these few simple tips, you and your pirate crew can enjoy sharing the lingo, fashion and fun, while maintaining a professional demeanor.